For over 20 years, Uncle John has been entertaining kids with his unparalleled magical & musical puppet shows at birthday parties in New Jersey, including Belleville Puppet Shows for children's birthday Parties, preschools, daycares, camps & corporate / private events. He is a fully insured, full time professional puppeteer who travels throughout the entire New Jersey area. Uncle John is the only NJ puppeteer to utilize a blend of TV, cartoon & popular muppet style characters that your children will recognize. Using his master voice-over skills (as seen on TV), Uncle John is able to mimic over 35+ TV, movie and cartoon characters, who will directly interact with your children, kids & entire audience, encouraging participation at your Belleville birthday party or event - truly bringing the puppets to life. Uncle John covers parties ranging from : kids birthday parties, preschool, school, camp entertainment, or private birthday or family events in Belleville, NJ. Uncle John's Puppet Show can accommodate any New Jersey Kids Party Entertainment in Belleville, NJ your party, preschool, organization, library or event requires. 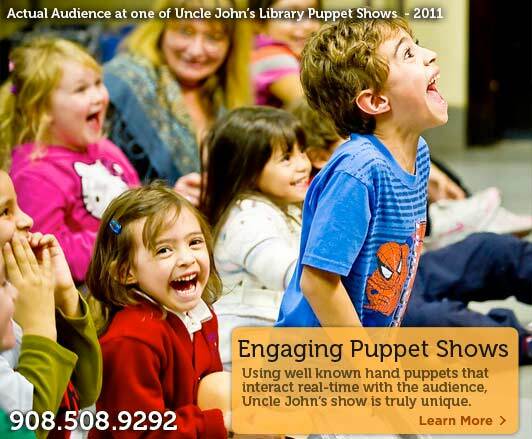 Call Uncle John the Belleville NJ Puppeteer today for more information and a free brochure & reference list. Looking for a memorable, unique, funny & kid-friendly Belleville, NJ Birthday party that's sure to impress? Uncle John has been providing puppet shows in the Belleville, New Jersey area for 20+ years and is sure to make any birthday party a hit! Seeking a unique, fun, enjoyable & fully interactive program for your pre-school, day-camp or summer camp in Belleville, NJ ? Uncle John's musical puppet show combines elements of a DJ, magician, and a professional children's puppeteer in one. Major roads in the town of Belleville, NJ include Washington Avenue & Union Avenue. Belleville is located within Essex, New Jersey. Towns that border Belleville include Nutley, Bloomfield, North Arlington, Rutherford, Lyndhurst & Montclair. The zip code of Belleville, NJ is 07109. Belleville has a population of just under 36,000 residents. The current mayor of Belleville is Ray Kimbie. Belleville Birthday Parties, Preschools, Daycares, Camps, Libraries, Belleville Birthday Party Ideas, Puppets and more. Uncle John's one-of-a-kind puppet show offers a memorable, interactive & family-friendly entertainment for any kids' party in Belleville, NJ. Call today at 908.508.9292 with any questions regarding the show.